This function allows the users to Upload External File to Group Post. It can be used to create a group for posting manual chargers using a .CSV file instead of manually. It requires approval from the principal before the fees can be posted to the student's. This function will be used to setup the layout of the upload file. 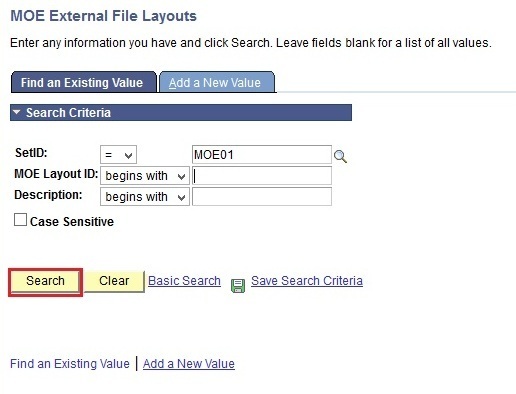 MOE Officers: Update access to make changes to existing file layouts or create new file layouts if required. Class Teachers: View access to verify layout before creating the upload file. Navigate to Main Menu > Setup SACR > Product Related > Student Financials > Charges and Payments > MOE External File Layout. 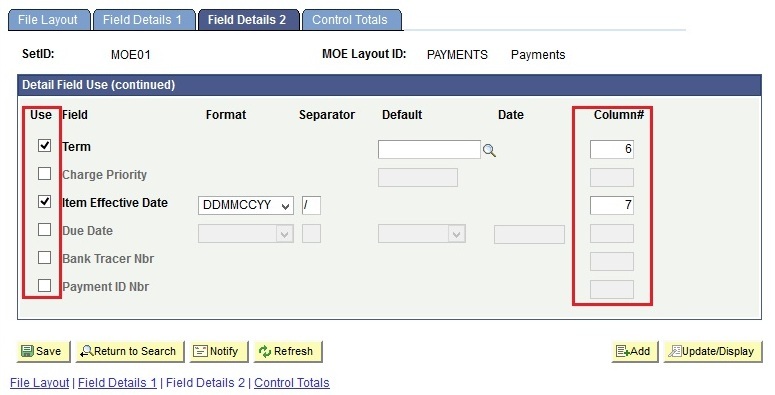 In the Add a New Value tab, enter values in the Set ID and MOE Layout ID fields. You will be directed to the MOE External File Layout page. 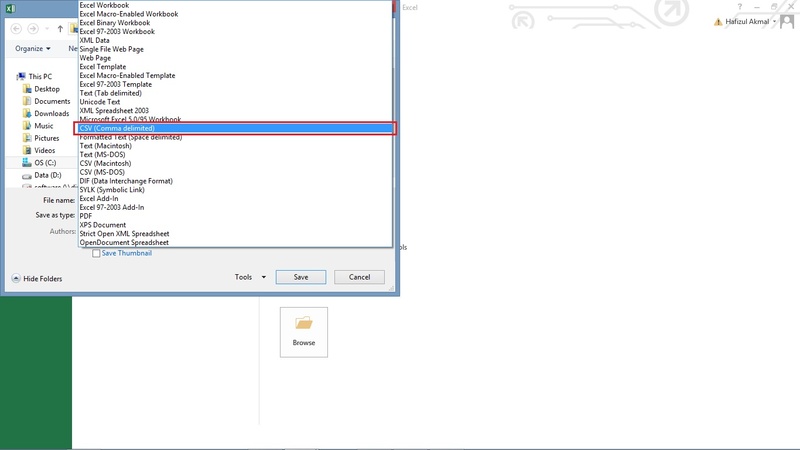 In the File Layout tab, enter values in the Description and Short Desc fields. In the Header and Trailer gridbox, select the Header and Trailer checkboxes if Header and Trailers are required in the upload file. 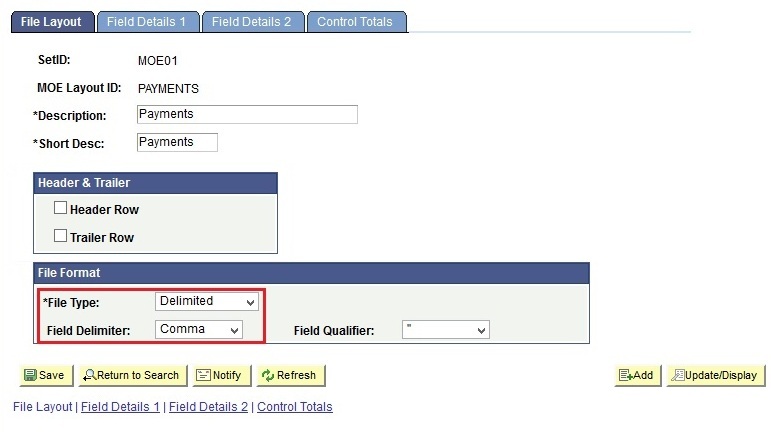 In the File Format gridbox, select "Delimited" in the File Type field, select "Comma" in the Field Delimiter field and select " " " in the Field Qualifier field. 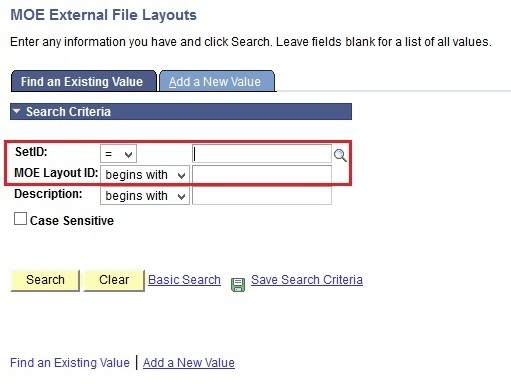 In the Field Details 1 tab, tick the fields that are required in the upload file. 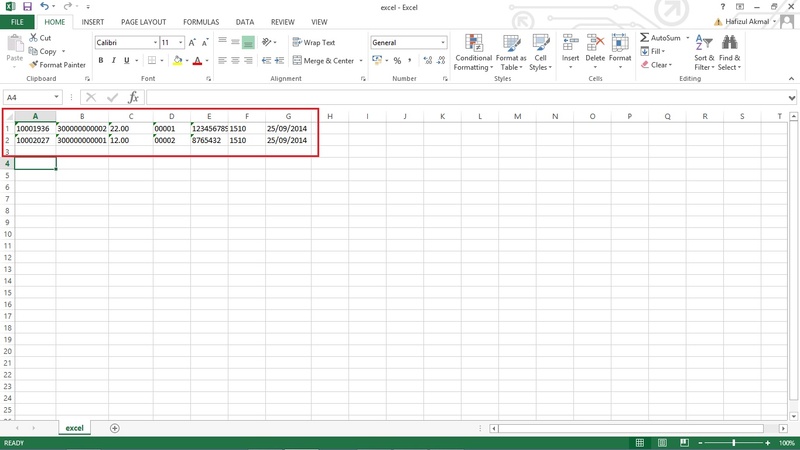 Also specify the position of each field in the file using the Column Number field.. Note: You can Default certain fields if their value is fixed however you still need to tick the checkbox next to them. These fields will not be required in the upload file. In the Field Details 2 tab, tick the fields that are required in the upload file. 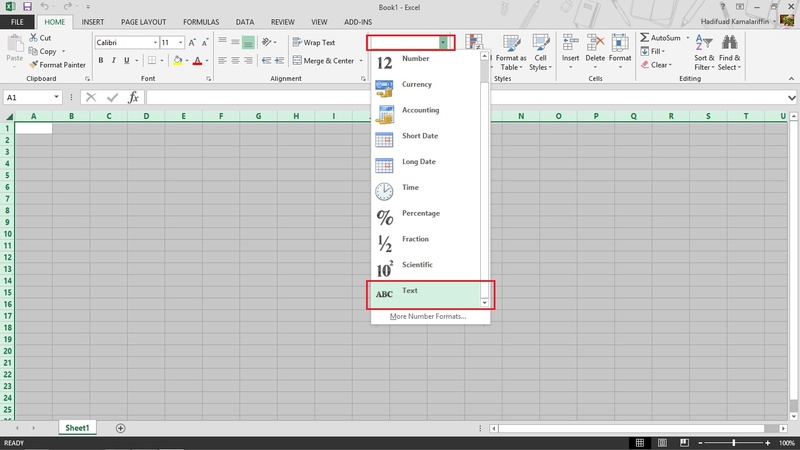 Also specify the position of each field in the file using the Column Number field. Go to the Control Totals tab. 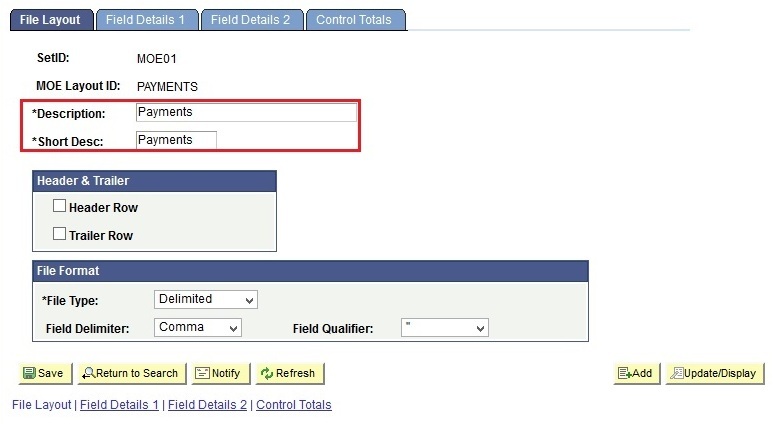 If Header and Trailer is checked in the first tab, then specify which fields will be entered in the header row and which fields will be entered in the trailer row. 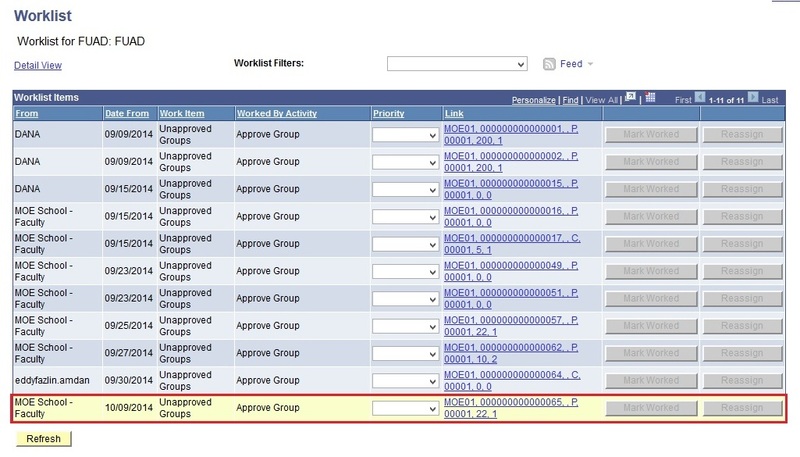 Check the fields that are required, specify their position in the file as well their column number. Note: Make sure the Origin ID is selected. This is a required field. Teachers will refer to the File Layout setup by MOE to create their upload files or download the Collection (Payment) Template from here. This function can then used to upload the data in the system and create a group for posting. The group will be automatically sent for approval. Create the upload file according to the File Layout page. Note: Refer to the File Layout using the page Main Menu > Setup SACR > Product Related > Student Financials > Charges and Payments > MOE External File Layout. Also take note of the fields that are checked and it's respective column number. Follow the column number when creating the upload file. Note: Any changes to the after it has been saved should be done using Notepad only. This function will be used to upload the file created in the system. 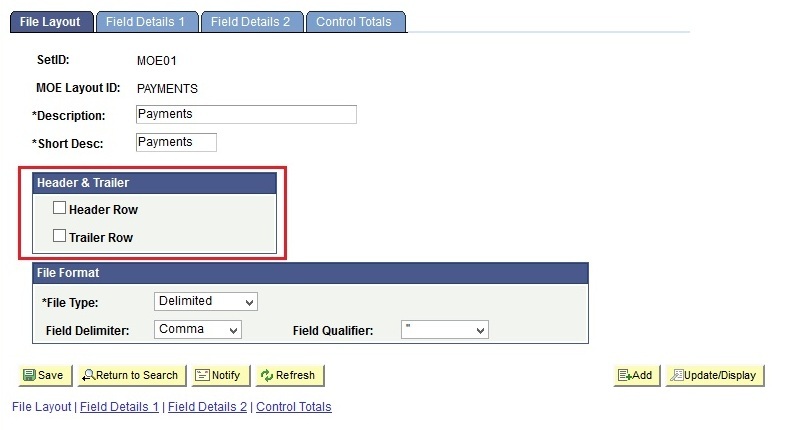 Enter any value in the Run Control ID field. You will be directed to MOE External File Upload page. 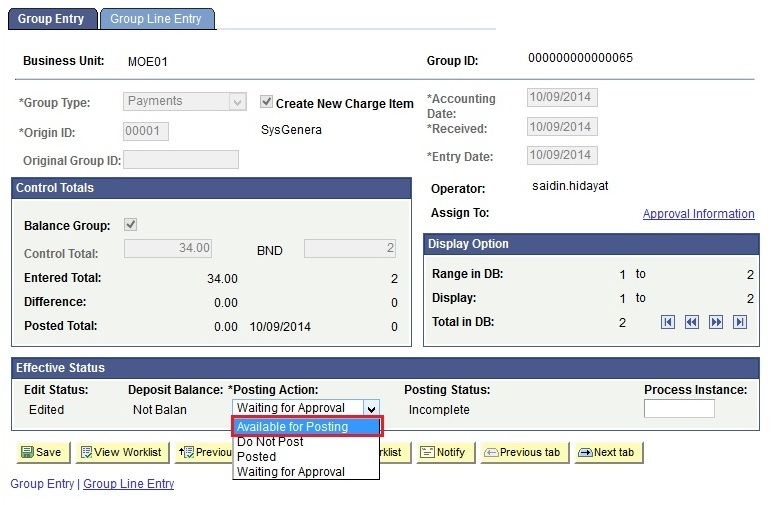 Enter values in the Business Unit, Group Type and MOE Layout ID fields. 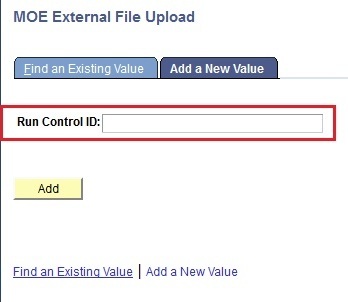 Note: Ensure that the MOE Layout ID is the same as that used to create the upload file. Select the Balance the Group checkbox. Note: Click on the Browse button to search for the file. Select the file and click on the Open button. Then Upload the file. In the User Scheduler Request page, select the External File Uploader checkbox. You will be directed back to the MOE External File Upload page. Take note of the Process Instance number. 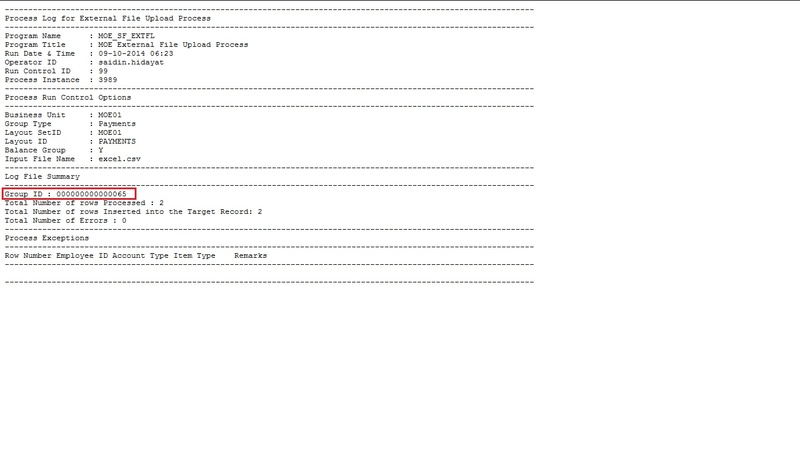 Click on the log file link, in the File List section. Verify the information in the summary log. Any errors encountered during the process will be mentioned in the log file. The group will only contain rows that went through successfully. 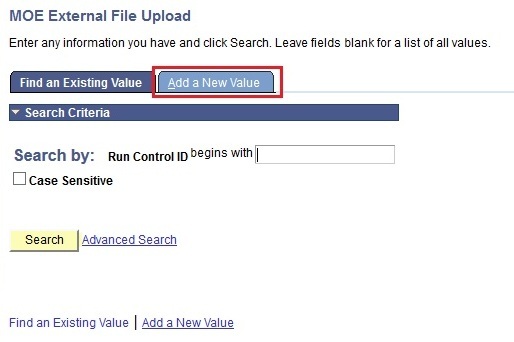 Correct the errors and create a new upload file for all rows that has errors. 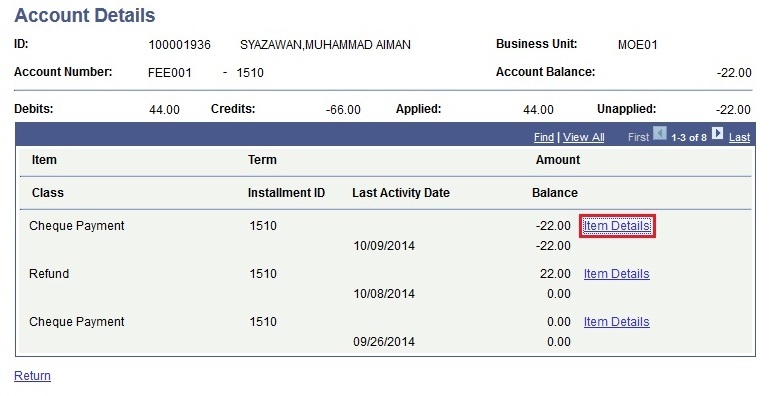 Take note of the new Group ID in the report generated. The group has automatically been sent for approval. Login as the School Principal. Login as the Class Teacher/ Finance Officer. 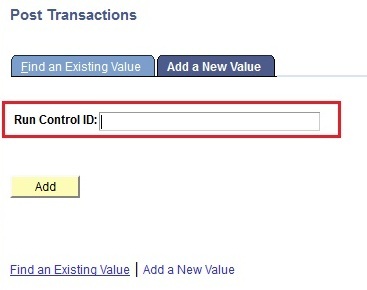 In the Add a New Value section, enter any value in the Run Control ID field and click the Add button after that. 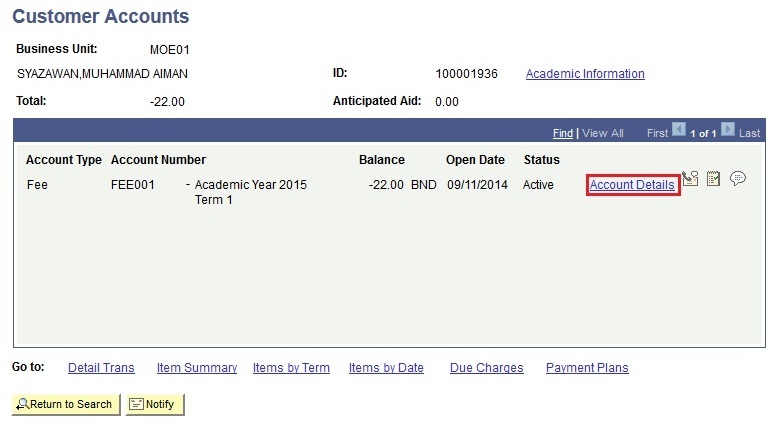 Navigate to Main Menu > Student Financials > View Customer Account. 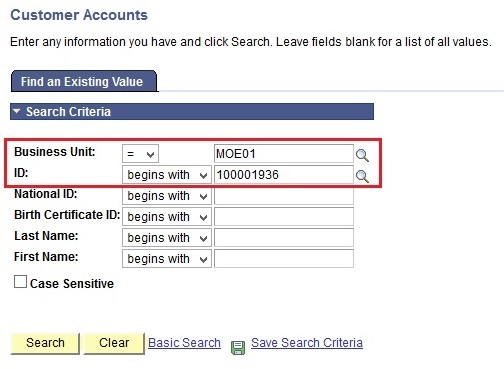 In the Find an Existing Value section, enter the values in the Business Unit and Student ID fields.